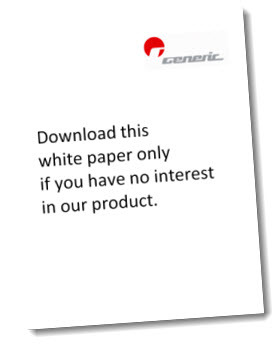 How is it that a quality white paper on a hot topic can still generate bad leads? It’s got to be the media, right? Wrong. An educational white paper by an industry analyst on a hot industry trend will tend to generate a broad spectrum of prospects, including a large subset who have no interest whatsoever in your solution but want to stay abreast on what’s new in your space. In contrast, a “buyer’s guide” by a leading analyst on the 10 key criteria to employ when choosing a solution (of the type you sell), along with side-by-side comparisons of the leading vendors (your company included) will tend to generate more qualified leads, albeit fewer in number, namely people who are actively researching or evaluating solutions. When embarking on a content marketing strategy, one of the critical first steps is to determine the types of leads you want to generate. Are you looking to generate as many contacts as possible, regardless of where those people are in the selling cycle, so you can continue to nurture and educate them on the value of your solution, and generate qualified leads over time? Then your offer should have as broad appeal as possible. Alternatively, if you’re only interested in generating qualified leads, let’s say: companies who have an active project necessitating a solution like yours, and who are actively shopping for such a product, then the information you offer needs to be tailored to people later in the selling cycle. Choose your content carefully. If qualified leads are the order of the day, and nothing less will satisfy sales, then ensure your content is aligned with that goal. This entry was posted in B2B Marketing, Content marketing, Content Syndication, Demand Generation, lead generation, White Paper Syndication, White Papers and tagged Content marketing, Content Syndication, white paper marketing, White Paper Syndication on September 16, 2011 by Howard Sewell. Some great points here. I think marketers need to have *both* types of content that you refer to above. In my research with technology marketers for ITSMA, I find that marketers do not offer content for each stage of the buying process. Something else that they don’t do, but should, is creating versions of their content specifically for salespeople. Let’s face it; salespeople don’t want to read a 20-page white paper, which means they will be unlikely to use it during the sales process other than to maybe send it out to prospects. But if you created a PowerPoint version of the paper with just the highlights, they’re more likely to use it.